An "educated" raw vegan, or 100% plant-based eater, or even a Standard American Diet eater for that matter, is one who fully understands and APPLIES the fundamentals of nutrition no matter what "food" they decide to consume. There have been many rants and raves about this diet or that diet and the "debate" will continue forever. But that empty debate will only be carried on by those who 1) do not understand AND APPLY the fundamentals of nutrition across several different diets in their life or 2) they are confused, or 3) they are not ready to leave their comfort zone to see what really happens when one does more than just reads "research". It is my intention to share only what I have experienced. Plus the experiences of those that I have known and coached for almost the last four decades. While any research I refer to has merit (some more than others, since 99% of all "studies" are food or drug industry funded), I NEVER rely on anything I read. I try it. Not just for a month, or even year or two. 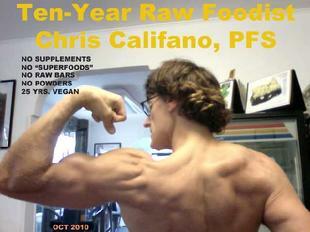 I have consumed 100% plant-food (they call it "vegan") since 1985, and 100% raw WHOLE fruits/veggies etc. since 2000. I have even experimented with some cooked food (mostly whole not refined, and clean; no added salt, oil, condiments, supplements, etc.) for periods after eating raw for ten years just to see my bodies, and my client's reactions when they did the same. I have not met many educated eaters in my life. I must admit that 99% of people that I have met have had no idea how many calories they are eating, the proportion of macro nutrients, or where exactly their micro nutrients are coming from, if they are being assimilated and utilized at all. Fewer still have ever strayed from the diet that they grew up with or have been told by popular mass media to continue to consume. Some may even adopt "other" diets, but the food remains basically the same. Still they remain in the dark about the building blocks of nutrition. When it comes to applied fitness or training, those few who get results do so in spite of their diets or training not because of it. This has been my experience since I started as a certified physical fitness specialist 35 years ago, spending my own money on brick and mortar stores and teaching centers (to make very little return on it I may add, compared to the mainstream who would rather follow the herd and stay safe), and slowly and steadily discovering the best way to eat and exercise for the average person. I want to state once and for all that my growing and morphing site is not about building muscle! I only use truly naturally pure muscle building as part of the three (or four) fundamentals of fitness: 1) Strength 2) Cardiovascular Endurance 3) Flexibility & 4) Body Composition. The BEST way to monitor whether your diet is working is to see improvements in ALL four of these critical life sign areas, not to mention your digestive comfort, bowel movement, body and breath odor, skin condition, plus if you ever suffer from even the mildest of mild "cold and flu" symptoms. It has been my experience and observation that most people suffer almost every day from some minor ill, and then succumb not only to major diseases, but they suffer much more during their lives and during the last years when they eat an animal-based and/ or processed food diet. It is scientifically known by all that eating foods such as these will increase muscle mass due to excess nitrogenous waste being stored for long periods of time. Being educated and being vegan or raw are not the same thing. Even with my background in basic nutrition I fell for the raw gurus early on. Or, perhaps I misunderstood them. Either way I am sure that their message was not clear, and it remains foggy. My main goal is simply to unravel the "mystery" and "debate" not by spewing and debating "research" and "studies" galore, but by ACTUALLY sharing my long-term experience and professional observation. That is what I call And Educated Raw Vegan. Chris is a new breed of experienced "intelligent raw foodists" who are not swayed by the lament of the masses. They live by the fundamentals of nutrition and fitness and ulitmate wellness, whether cooked, raw or whatever. In this case, raw! ... "malnourishment" so they add some cooked food. Ten percent. If all they needed was ten percent, then it is not a major problem. If they needed forty or fifty percent or eighty percent then it would be a problem. They also say that eating a high sweet fruit diet provides too much sugar and will cause problems. They also said in one person's experience that after two years of eating a high fruit diet they had some problems. Well, I have been raw or ten years (vegan for 25) and it does take time to transition. I would not have been ready for a 100% raw primarily fruit diet right away, coming from a standard American diet, albeit vegan for 15 years before I went raw. I would no sooner make such a drastic diet change as I would add a hundred pounds to a weight training exercise suddenly! In addition, you can easily cut and balance the sweet content of a fruit meal by adding celery or lettuce, or make sure that you are eating enough of these other foods at another meal. Eating ten percent more or even twenty percent more cooked greens or vegetables is not an option if genuine health is your goal. Experience has taught me that transitioning to a good thing is key. Moving forward on a regular basis is what striving is all about, a respected quality in our society. To say that eating cooked food can somehow improve your health does not take into consideration those people who are actually improving their health, and moving our society slowly forward to better health in the generations to come. Why must we fall victim to mediocre? Good, honest and intelligent raw foodists are not in denial. Those who say that adding cooked food are. Of course, those who are fanatical about cooked or raw, in my opinion are defined as those who are not following the fundamentals of nutrition but instead bring "morality" or "culture" into the argument instead of the basic biological framework that creates the best diet for humans past or present. We should eat according to our original design principles, not based on opinion.